Picture book comics – who woulda thunk it! And picture book comics about existential angst! Laced, often enough, with scathing social commentary, ironic asides and … horror of all horrors, sadness! Unthinkable, right? 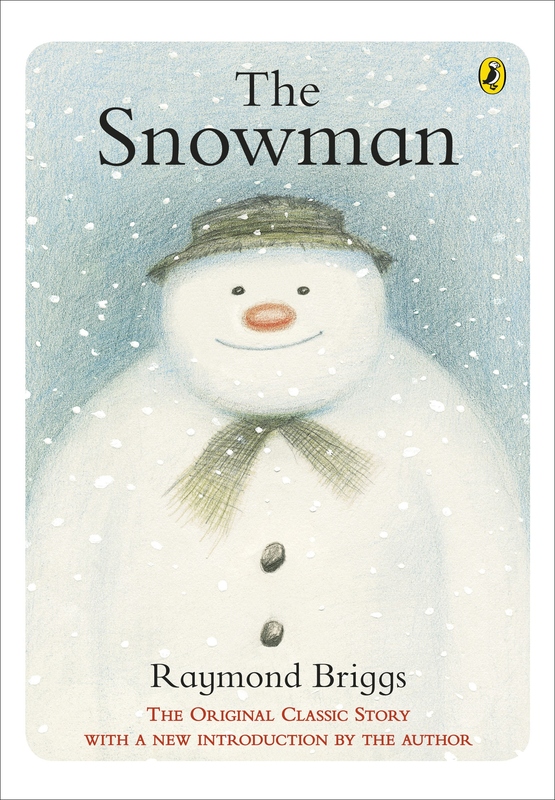 And yet, Raymond Briggs, one of Britain’s most celebrated authors and illustrators, does all of this and more, with incredible skill in books like Fungus the Bogeyman, The Snowman, The Bear , the Father Christmas books and Ug the Stone Age Boy. The Snowman, the first and most famous of Briggs’ comic picture books, is a wordless tale about a young boy whose snowman comes magically to life one night. It lumbers into his house, explores it with childlike wonder, then takes him on a magical flight through the night sky. They return, the boy goes to sleep and wakes in the morning to find…. The book is very similar to The Bear, drawn years later. leaves puddles in the middle of the road. 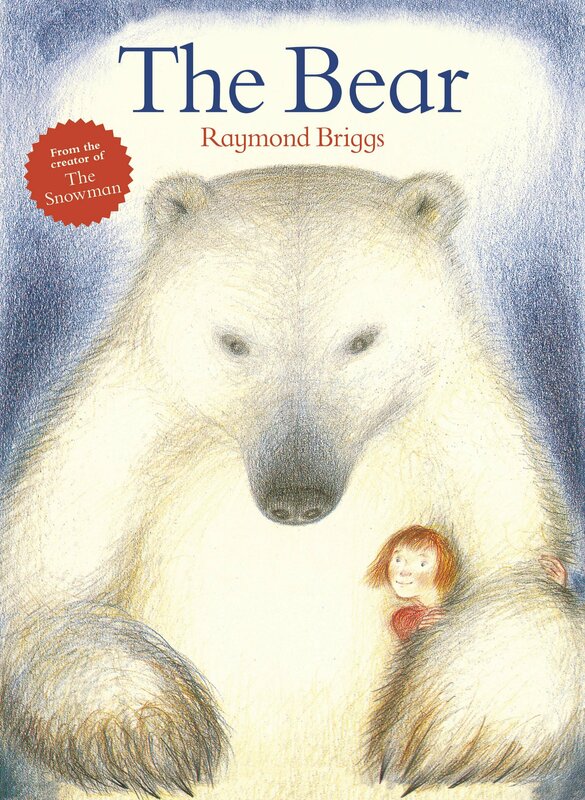 later, that explores the relationship between a little girl and a polar bear that appears in her house one night. Misfits struggling to belong are a recurring theme in Briggs’ work. 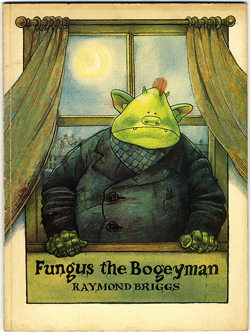 Fungus the Bogeyman, chronicles a day in the life of a bogeyman, an odious creature that is supposed to delight in scaring humans. Fungus is different, however, fretfully pondering the reason for his existence. What, he wonders as he plods through his day, is the point of the life he leads. Why, if he has everything a happy bogey needs, is he so darned blue? And why can’t anyone else in his clan understand his misery? 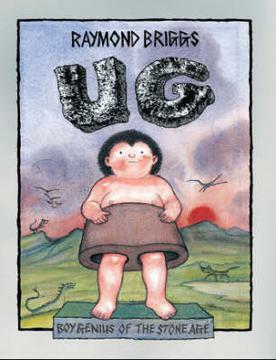 Ug the Stone Age Boy, (reviewed earlier here) struggles to rise above his circumstances. Like Fungus, he questions the way he is supposed to live his life, and attempts to invent all kinds of improvements that could revolutionize the life his tribe leads, only to be repeatedly beaten down and ridiculed. For all the humour and the sweetness of the illustrations, the books have an undercurrent of sadness running through them. The Father Christmas books are relatively lighter in tone, chronicling Santa’s attempts to get away from his mundane life. 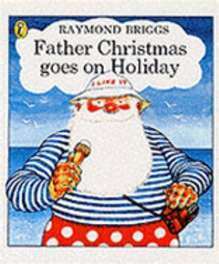 Briggs’ Father Christmas is just a regular guy – he grumbles a lot, likes a good fry up for breakfast, hangs out at home in his underclothes, reads his paper and hates the “blooming cold.” In Father Christmas Goes on Holiday, Santa exchanges his red suit for regular clothes and heads out to get some sun. A lot of Briggs’ artwork is executed in colour pencil. The soft, grainy textures of his illustrations perfectly complement the dreamlike progression of stories like The Snowman and The Bear while watercolour and inked lines perk up the art in Fungus, Ug and Father Christmas. Much like his layered artwork, his stories too feel layered and complex. 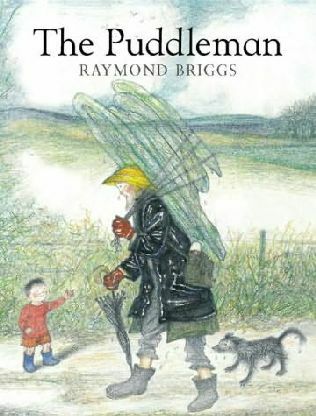 Briggs has used a similar format – picture books designed like comics – to address more adult themes like politics and the horrors of war (The Tin-pot General and the Old Iron Woman, When the Wind Blows) and lovingly chronicle his own parents’ lives (Ethel and Ernest). Love, love, love all of these! The movie versions of The Snowman and the Father Christmas books are great fun! Thanks Lavanya for bringing so many books of Briggs to us. We have only "The Snowman" and everyone loves it. I think it would be nice to get hold of these other books too. Where do you pick these books from ? The Snowman is a classic! The younger child like Ug the Stone Age Boy and Fungus the Bogeman. 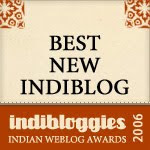 Must check out the others you have listed, wordjunkie! Have only seen the animated version of the Snowman, that left the 6.y.o in tears few years back - a first for us! Now, to look for these in prints and find more cheer!